On Thursday, February 14, teachers across a number of Iranian cities took to the streets to protest poor working conditions, low pay, and the clerical regime’s systematic oppression of worker’s rights activists. 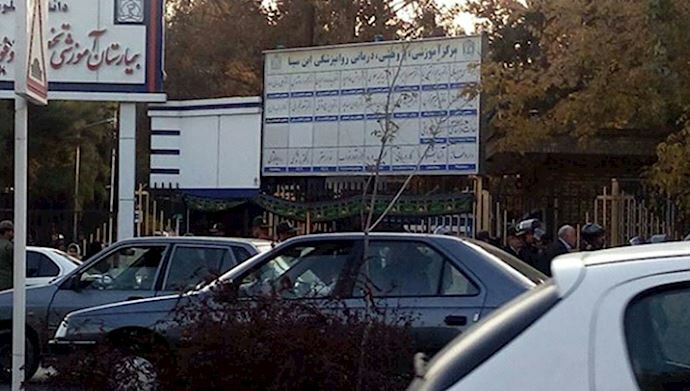 In typical fashion, the regime responded to the teacher’s protests with repressive tactics. There were plainclothes regime agents present at the rallies and the regime deployed agents to disperse protests in some cities. Teachers are under immense financial pressure. Soaring inflation and the decline in Iranian purchasing power has left teachers earning less than $100 a month, putting teachers below the regime’s own recognized poverty line. Among the political demands of the teachers is the right for minority students to be educated in their own language. The regime has systematically suppressed minority rights and removed minority languages from the public sphere. Regime officials should fear the swelling of the teachers’ movement. The country’s educators are articulate, well-organized and enjoy the support of the Iranian people. The events on Thursday clearly demonstrated this. The nation’s teachers were able to effectively mobilize without warning and draw large numbers of supporters. In 2018, Iranian teachers were among the demographics that organized extensive protests. On at least three occasions, Iran’s teachers organized rallies and public demonstrations. Each time, the regime responded with force and repression, yet it was unable to break the resolve of the country’s educators. Iran’s teachers are among the most ardent opposition to the Iranian regime and their numbers are increasingly participating in the Iranian opposition movement, the People’s Mujahedin Organisation of Iran (MEK). The MEK and Iran’s teachers share a united vision: both want a brighter future filled with more opportunities, increased stability, and more civil freedoms for future Iranian generations. 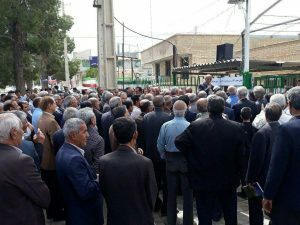 Tens of protesters object the continued abduction of the retired teacher and union activists, Hashem Khastar by the Iranian intelligence forces. Tens of activists joined the family of Mr. Hashem Khastar, the retired teacher and head of the Teachers Union Center in the northeastern city of Mashhad on Monday to protest his abduction by the Iranian regime. 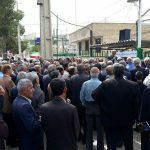 Dozens of protesters rallied outside of Ebn Seena Hospital to demand Khastar’s release from the psychiatric facility where he is being held without cause. State security forces and anti-riot units were already present and immediately arrested Khastar’s son. State security forces then arrested Mrs. Maleki as well and transferred her to an unknown location. Mrs. Maleki is currently in poor health following open heart surgery. Mr. Khastar’s sister also refused to leave the hospital, despite orders from security forces. Witnesses saw her shouting for the release of her brother. Hashem Khastar was abducted from his farm in Mashhad on October 23rd by security forces. After his wife reported his disappearance, she received a call from a member of the Revolutionary Guards, who said that her husband was hospitalized in the psychiatric ward of Ibn Seena Hospital. Mr. Khastar has no history of psychiatric illness. He takes blood pressure medication, which is normal for his age but has no other physical ailments. “On Thursday, I went to the courthouse for permission to visit my husband, Mr. Seyed Hashem Khastar, in Mashhad’s Ebn Seena Hospital. There was no file or records about this arrest. I spoke to the deputy public prosecutor about my husband’s arrest and he said they had not issued any orders for his arrest. I spoke with another deputy public prosecutor and he said we had not given any orders either. I received the same answer from the Intelligence Ministry, the IRGC intelligence and the police. “The Social Emergency unit arrested him outside his orchard and took him straight to the Ebn Seena Hospital. They took blood from him and gave him an injection… Considering the fact that my husband’s life is in danger in this psychiatric hospital, he must be released immediately,” she added. Mrs. Maleki asked the protesters to demand that the Iranian regime’s judiciary immediately release Khastar. United Nations Secretary-General, the UN Security Council, the UN Human Rights Council and the Special Rapporteur for Human Rights in Iran to guarantee Mr. Khastar’s safety. Reports published on social media by MEK sources say that Mr. Khastar was arrested by IRGC intelligence agents without a warrant and transferred to a psychiatric ward. Mrs. Maleki described the roadblocks she had encountered in her efforts to visit her husband. “A nurse told me that Mr. Khastar has been hospitalized in an emergency room and is banned from any family visits, based on orders issued by security officials,” she said. “He was completely healthy and after retiring spent many of his days farming. The only medication he consumed were blood pressure pills. Khastar being hospitalized in an emergency section of a special facility for psychiatric patients means [authorities] injected a special type of medication with the intention of killing him, or he had been severely injured under torture or during his arrest,” Mrs. Maleki added. Khastar was a tireless advocate of teachers who had been arrested and imprisoned by the regime on a number of occasions for his activism. In the weeks leading up to his abduction, Khastar participated in protests on behalf of jailed teachers and made public calls for the release of his imprisoned colleagues. Teachers in Tehran protested in front of Parliament and the regime’s Planning and Budget Organization. They chanted: “Efficient insurance is our absolute right!” and “Imprisoned teachers should be freed!” Teachers carried signs saying: “Teachers, Workers, Students, United!” “Salary above the poverty line is the right of teachers!” “Bread, Labor, Freedom, Educational Justice!” “Access to quality, free and fair education is the right of all children!” The protests were shut down by repressive IRGC forces, who arrested dozens of teachers and injured several, MEK network reported. Mercenaries beat the protesters and confiscated their phones. One woman suffered a torn eye as the result of the violent mercenary response. 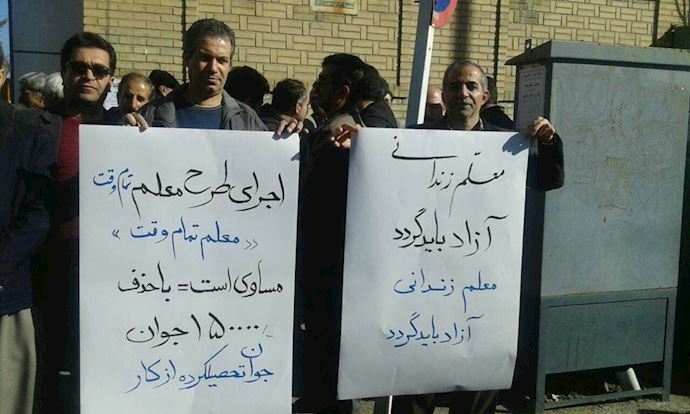 Teachers in Marivan carried a sign condemning the suppression of teacher protests in Tehran. 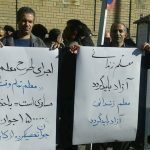 Speakers in Shiraz condemned theft by the government while teachers struggle to survive on insufficient salaries. Teachers in Bushehr conducted a symbolic funeral for Iranian education. A protest was held in Bojnourd, but repressive forces surrounded the protesters, preventing photos or videos from being taken of the gathering. Thursday’s protests were only the latest in a series of demonstrations by teachers. 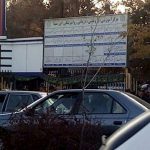 Iranian educators have become more and more vocal about the deficiencies in the education system in the past few months, and their protests show no signs of slowing.